UPDATE: A storm system is headed into southern Minnesota and northern Iowa that will bring some heavy and wet snowfall just in time for the weekend. While spring started out on a cooler note, temperatures rebounded Wednesday across the region. 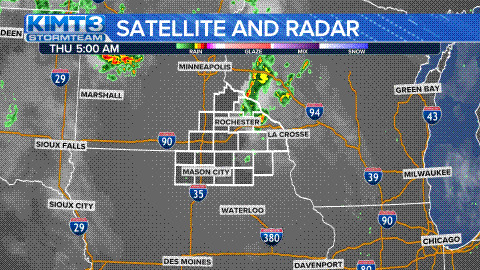 But it won’t last into the weekend, as StormTeam3 is tracking a storm that is heading into southern Minnesota and northern Iowa. Clouds will increase Wednesday night before we warm up Thursday with sunshine and highs in the mid-40s. WINTER STORM WATCH IN EFFECT FOR MUCH OF VIEWING AREA. But there is a system headed our way that will bring some nasty weather for the weekend. According to StormTeam 3, the system will approach the region late Friday afternoon. The storm will begin with rain as temperatures rise into the lower 40s, but it transitions into snowfall in the evening beginning around 9 p.m. Moderate snowfall will take over north Iowa and southern Minnesota overnight Friday and through Saturday morning – with the best chance for heavier snow along and east of Interstate 35. The intensity of the snow will dwindle a bit more by late Saturday morning and into early Saturday afternoon. Some flurries will stick around, but the major accumulations will come to an end. StormTeam 3 is forecasting this will be a wet and heavy snowfall, with temperatures in the mid- to upper- 30s before rebounding again into the lower 40s.